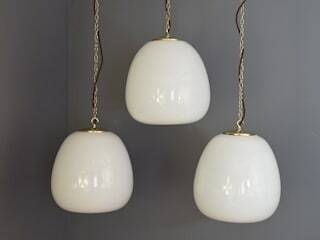 At Ashby Interiors, we have one of the largest ranges of restored Art Deco Opaline lighting in the UK. Many styles are available in multiples which makes them ideal for installation in hotels, restaurants and cafe's as well as private residence. We also stock a range of quirky vintage interiors and our own range of interiors made from genuine aero salvage. We pride ourselves on offering quality products which are typically hard to source and providing great customer service. We are happy to work with customers to suggest which lights from our range would best suit their requirements.